Anxiety can be defined as a feeling of worry or nervousness related to a real or an imagined event. Brief anxiety can help us adapt to our environment by motivating and keeping us safe. For example, being cautious around an area where there could be poisonous snakes. Intense and prolonged anxiety can impact our ability to perform competently or inhibit people from engaging in daily activities at all. For example, excessive worry about school prevents a student from attending. People with maladaptive anxiety typically overestimate threats in the environment. Anxiety disorders are the most common mental health issue in North America. Anxiety manifests itself as thoughts, emotions, bodily sensations and behaviours. When the symptoms are persistent and severe, and social, cognitive and daily life is impacted, the anxiety could be dysfunctional. Some of these experiences are a typical part of being human in appropriate amounts. Otherwise, can be an indication of a medical and/or psychological problem. Out of the normal range they can cause substantial personal suffering, significant difficulties in the areas of social and occupational effectiveness, as well as other areas of functioning (ie. self-care, health, etc.). Please do not use the above for diagnostic purposes, as it is very general. Self-diagnosis can be harmful. Contact a health care provider to consult if you believe there is a concern. The experience and cause of anxiety is based on the individual; therefore the treatment is shaped to each client. 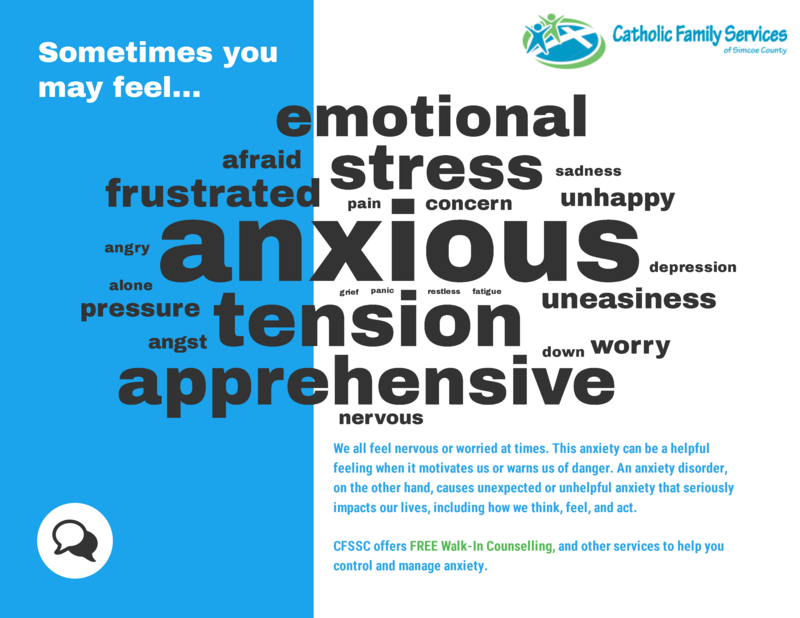 The counselling services we provide at Catholic Family Services of Simcoe County may help develop the skills to decrease anxiety. You can discuss treatment options with your health care provider. If you are interested in our anxiety counselling programs please contact us at (705) 726.2503, or toll free at (888) 726.2503, or by clicking here.